High quality research on traumatic brain injury (TBI) in India is lacking but essential. Introduction: Over a quarter of the world's trauma deaths occur in India, with traumatic brain injury (TBI) as the leading cause of death and disability within trauma. With little known about TBI in India, we set out to do a systematic review to characterize the quantitative literature on TBI in India. Materials and Methods: The following databases were searched from their inception to December 31, 2015: PubMed, Cochrane, Web of Science, and the World Health Organization's Global Health Library, using the keywords: neurotrauma, brain injury, traumatic brain injury, TBI, head injury, and India. Articles were screened by two independent reviewers, with disagreements arbitrated by discussion or a third reviewer. Results: A total of 72 manuscripts were included, encapsulating 19962 patients over 27 years in 14 states of India. The sample-size-weighted mean age was 31.3 years, male-to-female ratio was 3.8:1, and sample-size-weighted mean in-hospital mortality was 24.6%. Age and mortality did not change significantly over time. Road traffic accidents (55.5%) and falls (29.2%) were the most commonly reported mechanisms of injury for TBI in India. The mean quality of reporting on TBI in India was 65.7%, according to the appropriate EQUATOR guideline score. Conclusion: The quality of reporting of quantitative studies published on TBI in India is low, and future methodological excellence should be ensured. The demographics and outcomes identified can be used as an epidemiological baseline for future research on TBI in India. Future research can build upon this platform to develop and refine context-appropriate policy recommendations and treatment protocols. The implementation of certain checklists, like CONSORT for randomized-controlled trials, has led to significant improvements in reporting quality. TBI is a complex disease process, but the results of this systematic review can be used as an epidemiological baseline for future research on TBI in India. According to the most recent Global Burden of Disease study, over a quarter of the world's trauma deaths occur in India., In addition, traumatic brain injury (TBI) is the leading cause of death and disability within trauma, and the majority of this burden is experienced by low- and middle-income countries (LMICs)., Maximizing prevention and optimizing treatment for TBI will be a critical strategy to address the growing number of deaths and disabilities from these injuries. However, there are large gaps in research on TBI in countries with its highest burden.,,, Furthermore, global research on neurotrauma must be performed in context because the transfer of evidence-based guidelines from a high-income setting do not apply to the injuries experienced in LMICs., Global health professionals from high-resource setting have been encouraged to partner equally with the clinicians and administration in LMICs to improve the quality of research and ultimately the delivery of care. Pursuing this in neurotrauma research will ensure that local concerns are prioritized in order to more effectively use the shared resources of comparable global health movements. In order to address a growing TBI pandemic, high quality research is necessary to drive policy decisions on trauma prevention and treatment guidelines. Little is known, however, regarding the basic characteristics of TBI in India. Previous studies have estimated the mortality rate for TBI in various areas in India to be approximately 14.7%, but this has not been systematically assessed nationwide.,, Similarly, little is known about the demographics and mechanisms of injury for TBI in India, or the quantity and quality of academic literature published on this topic. We set out to do a systematic review to characterize the quantitative literature on TBI in India. We performed a systematic review of the following databases: PubMed (January 1, 1946 to December 31, 2015), Cochrane (January 1, 1898 to December 31, 2015), Web of Science (January 1, 1864 to December 31, 2015) and the World Health Organization (WHO) Global Health Library (January 1, 1947 to December 31, 2015). We searched using appropriate combinations of keywords and MeSH terms including neurotrauma, brain injury, traumatic brain injury, TBI, head injury, and India [Appendix 1] [Additional file 1]. 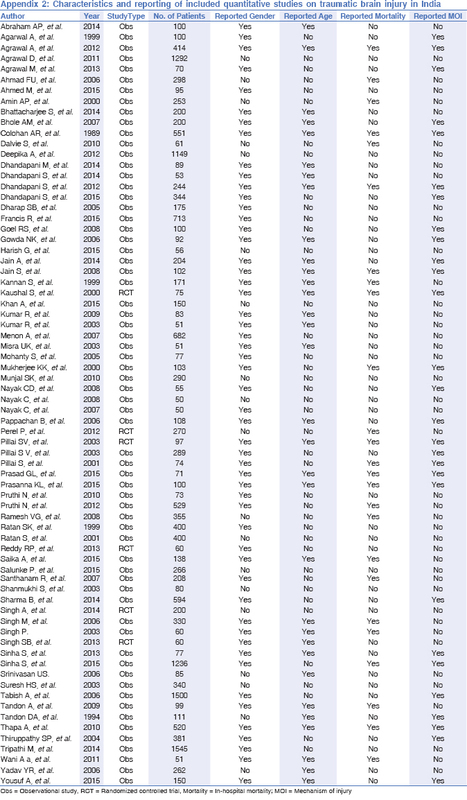 We checked the reference list of all included articles for additional studies. The inclusion criteria were case series, case-control studies, cohort studies, randomized studies, systematic reviews, and meta-analyses in English language including 50 or greater human patients of any age who experienced TBI in India. Patient data was required to have originated from India. Neonatal and birth trauma studies were excluded. Case reports, comments, editorials, and letters to the editor, as well as any study with a sample size less than 50, animal studies, and articles without full-text available online were excluded. TBI included any definition provided by the authors of the reviewed studies. Prior to beginning the systematic review, the search protocol was registered with PROSPERO, the international prospective register of systematic reviews (no. 35578). Outcomes of interest in the quantitative portion of this study include quality of reporting, patient age, patient gender, Mechanisms of injury, and in-hospital mortality. Mechanism of injury included assault, burn, fall, railway accident, road traffic accident, and others. A quality score was created by calculating the percentage of completion of the appropriate reporting guideline: Randomized trials were assessed with the CONSORT guidelines, observational studies were assessed with the STROBE guidelines, and systematic reviews and meta-analyses were assessed with the PRISMA guidelines. Two investigators (BBM and DKV) independently determined study eligibility, first by title, then abstract, and then full-text, and independently extracted data from the full-text of the articles using a standardized extraction form in Qualtrics. Disagreements in study eligibility during the title review were resolved by including the article for further review. Disagreements in abstract review and data extraction were resolved through systematic discussion or data extraction by a senior investigator (MG or NPR). Disagreements in quality scores for each article were averaged if the score from each investigator differed by less than 15%. If the quality score differed by 15% or greater, the quality was assessed by a senior investigator. We tabulated the characteristics and results of all included studies; the analysis was quantitative. Patient demographics and mortality were calculated from all studies that provided this data using weighted averaging. Weights were based on the sample size of the study. 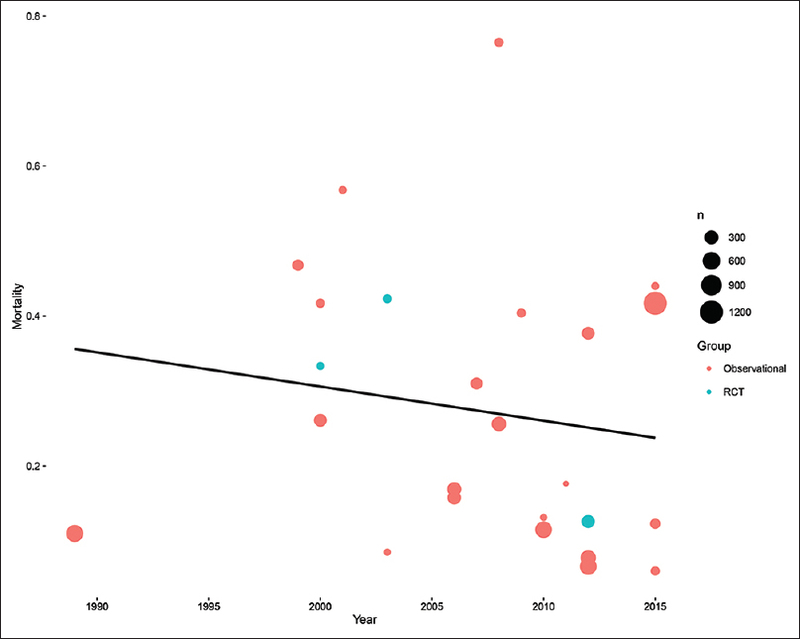 Linear regressions were performed on patient age, mortality, and quality scores over time. All statistical analyses were performed using R and geographic mapping using QGIS. Searching PubMed, Cochrane, Web of Science, and the WHO Global Health Library Report databases from their inception to December 31, 2015 resulted in 1508 manuscripts. After inclusion and exclusion criteria were applied by two unique reviewers (BBM and DKV), disagreements were arbitrated by discussion or a third reviewer (MG or NPR), and the references of the articles were reviewed for any missing manuscripts. A total of 72 manuscripts were found suitable and were included to represent the quantitative research published on TBI in India [[Figure 1], Appendix 2] [Additional file 2].,,,,,,,,,,,,,,,,,,,,,,,,,,,,,,,,,,,,,,,,,,,,,,,,,,,,,,,,,,,,,,,,,,,,,,, Six manuscripts (8.3%) were randomized controlled trials and 66 (91.7%) were observational studies. No systematic reviews were identified that met the inclusion and exclusion criteria. The quantity of published articles on TBI in India increased over time [Figure 2], as only one article was included from the inception of the medical databases to 1990 and 11 articles were included from 2015 alone. There were a total 19962 patients over 27 years in 14 states of India in the included studies [Figure 3]. Gender was reported in 53 (73.6%) studies, with a male-to-female ratio of 3.8:1, from 11018 (79.2%) male and 2897 (20.8%) female patients. The mean age was reported in 32 (44.4%) studies, and the sample-size-weighted mean across these studies was 31.3 years of age, ranging from mean ages of 1.6 years to 56.76 years of age. The age of patients experiencing TBI did not change significantly over time (slope = 0.099 years of age/year, P = 0.722) [Figure 4]. In-hospital mortality was reported in 25 (34.7%) studies, with a sample-size-weighted mean mortality of 24.6% for patients presenting with TBI in India. Reported in-hospital mortality for TBI in India varied by state. Mortality of TBI in India did not change significantly over time (slope = −0.46% mortality/year, P = 0.442) [Figure 5]. All 72 studies were assessed for reporting quality. Randomized trials scored an average of 55.0% using the CONSORT guidelines. Observational studies scored an average of 66.7% using the STROBE guidelines. In total, the mean quality of reporting on TBI in India was 65.7% and varied greatly by state [Figure 6]. The quality of reporting did not change significantly over time (slope = 0.28% score/year, P = 0.301) [Figure 2]. 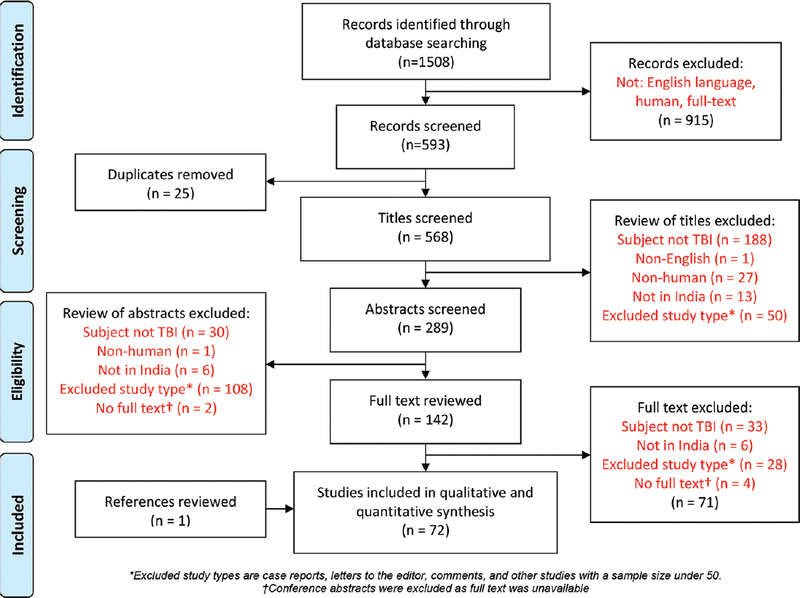 This study represents the first systematic review of quantitative research on TBI in India, pooling data from nearly 2000 patients, over 27 years, across 14 states, in 72 manuscripts. Almost 4 in 5 (79.2%) patients in the included studies were males, the mean age was 31.3 years, and the mean reported in-hospital mortality was 24.6%. The most common mechanisms of injury were road traffic accidents and falls, which together made up more than 80% of the reported patients experiencing TBI in India. The mean age and reported mortality did not significantly change over the past 27 years. Similarly, the reported mechanisms of injury for TBI in India compares well to data from other LMICs. Road traffic accidents have been reported to cause over half of the cases of TBI in China  and have been reported as the most common cause of TBI in many African countries.,, However, in the United States, the most common cause of TBI is a fall. The differences in gender and age profiles of patients experiencing TBI in India and other LMICs compared to high-income countries are most likely influenced by the differing mechanisms of injury in these settings. With a growing elderly population in the United States, and equal propensity to fall between both genders, the age and gender distribution of TBI in the United States is understandably older and more equally divided between males and females. Similarly, in other countries with high rates of road traffic accidents, the male predominance in trauma is estimated to be due to a relatively higher number of male drivers, despite recent increases in the number of female drivers. High quality research will be important to formulate recommendations to drive policy change in the area of neurotrauma prevention and treatment. In the included studies, there was wide variation in the quality of reporting, with studies scoring as low as 32% and as high as 100%, with a median of 68.2% on the appropriate quality checklist. There was no significant change in the quality of reporting in neurotrauma research during the study period. This may be due to limited resources for research because of clinical burden, language barriers for publishing in English journals, small sample sizes, or lack of information management systems to facilitate data collection and research. In Europe, a need for improved methodological quality and standardization of reporting has similarly been identified. 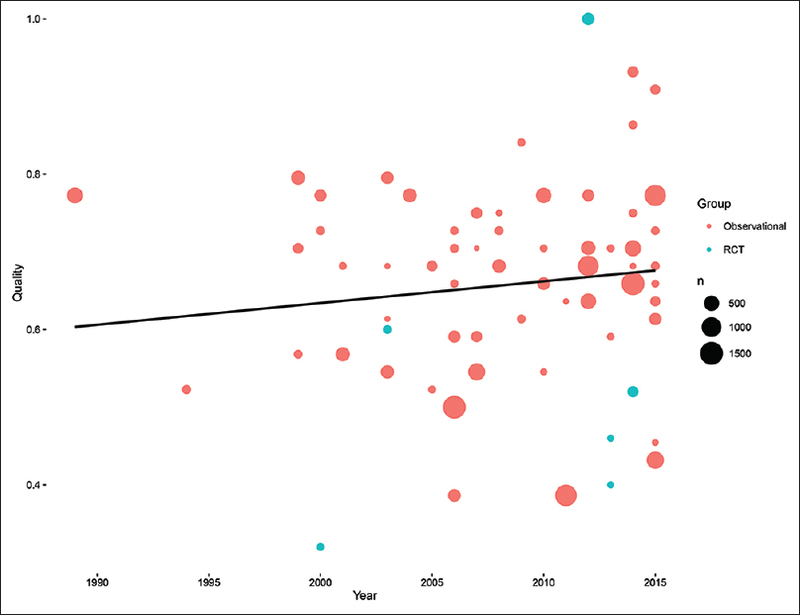 However, there have been significant improvements in the quality of surgical research in the United States over a similar time period. International medical journals have also noted that the implementation of certain checklists, such as CONSORT for randomized-controlled trials, has led to significant improvements in reporting quality. In India, however, low quantity and poor quality of reporting in medical publications is not isolated to research on TBI. Over half of all medical teaching institutions in India did not produce an identifiable publication between 2005 and 2014. The authors of that study concluded that Indian medical education needs a reform, similar to the Flexner reform in the early 20th century United States., Without high quality studies, recommendations for policy changes will not have strong clinical and empirical evidence. Research should be incentivized from the undergraduate and medical school level. In Norway, the implementation of a medical student research program increased the recruitment of medical graduates to a career in medical research. Though the quality of reporting in studies published on TBI in India is not significantly improving over time, a current and future push to ensure high quality study design should improve this trend. Our study has important limitations. We were only able to compile and analyze the reported data on TBI in India. Non-academic and rural medical centers were significantly under-represented in our dataset. Given that much of the data were from academic centers in urban areas, and two-thirds of the Indian population in India lives in rural areas, this data does not necessarily represent the experience of all patients who experience TBI and physicians who treat TBI in India. For instance, the reported in-hospital mortality of this review may be falsely low if hospital referral systems and ambulances function better in the urban, higher-resource settings that publish their data than in the rural areas. Partnerships between urban centers with greater research capability and rural centers should be encouraged in order to better characterize the experience of TBI across India. In addition, trend analyses were done using linear regression without adjusting for potential autocorrelation of the error terms. Therefore, results of significance tests should be interpreted conservatively. Finally, TBI is a complex disease process, making it difficult to generalize across heterogeneous studies., No distinction was made between mild, moderate, and severe TBI during data collection, so it was not possible to distinguish variance in these mortality rates. Thus, the results and discussion in this paper should be interpreted and applied carefully. Most of the evidence driving the policies and recommendations for the care of a patient who has experienced TBI come from high-resource settings. The implementation and adherence to treatment guidelines for TBI in high-income settings has been associated with a significant reduction in TBI mortality, though the reported TBI mortality in India has not changed. These high-income recommendations are best applied in well-equipped settings with similar resources. For areas that are vastly different, new policies and recommendations should be developed. If this is not feasible, caution should be exercised when transferring guidelines and policies between different contexts. A baseline of care should be measured for lower resource settings, similar to this study characterizing the quality of reporting, the demographics, and the outcomes of patients who experienced TBI in India. This certainly warrants future investigation to develop context-appropriate guidelines and recommendations. The quality of reporting of quantitative studies published on traumatic brain injury in India is low, and future methodological excellence should be ensured. Patients from the included quantitative studies on traumatic brain injury in India are young and largely male. Road traffic accidents are the most commonly reported mechanisms of injury for traumatic brain injury in India. The demographics and outcomes identified in this study can be used as an epidemiological baseline for future research on TBI in India. Future research can build upon this platform to develop and refine context-appropriate policy recommendations and treatment protocols. I, Benjamin Massenburg, on behalf of all the authors (Benjamin B. Massenburg, Deepa Kizhakke Veetil, Nakul P. Raykar, Amit Agrawal, Nobhojit Roy, Martin Gerdin), declare that there are no conflicts of interest that need to be reported and that ethical guidelines have been adhered to in the preparation of this manuscript. Norton R, Kobusingye O. Injuries. N Engl J Med 2013;368: 1723-30. Rubiano AM, Carney N, Chesnut R, Puyana JC. Global neurotrauma research challenges and opportunities. Nature 2015;527:S193-7. Puvanachandra P, Hyder AA. Traumatic brain injury in Latin America and the Caribbean: A call for research. Salud Publica Mex 2008;50(Suppl 1):S3-5. Puvanachandra P, Hyder AA. The burden of traumatic brain injury in Asia: A call for research. Pak J Neurol Sci 2009;4:27-32. Sitsapesan HA, Lawrence TP, Sweasey C, Wester K. Neurotrauma outside the high-income setting: A review of audit and data-collection strategies. World Neurosurg 2013;79:568-75. Rosenfeld JV, Maas AI, Bragge P, Morganti-Kossmann MC, Manley GT, Gruen RL. Early management of severe traumatic brain injury. Lancet 2012;380:1088-98. Ng-Kamstra JS, Greenberg SL, Abdullah F, Amado V, Anderson GA, Cossa M, et al. Global Surgery 2030: A roadmap for high income country actors. BMJ Global Health 2016;1:e000011. Colohan AR, Alves WM, Gross CR, Torner JC, Mehta VS, Tandon PN, et al. Head injury mortality in two centers with different emergency medical services and intensive care. J Neurosurg 1989;71:202-7. Thapa A, Chandra SP, Sinha S, Sreenivas V, Sharma BS, Tripathi M. Post-traumatic seizures-A prospective study from a tertiary level trauma center in a developing country. Seizure 2010;19:211-6. Abraham AP, Vidyasagar A, Lakshmanan J, Nair S, Joseph M. Phenytoin toxicity in patients with traumatic brain injury. Neurol India 2014;62:285-9. Agarwal A, Mahapatra AK. Visual outcome in optic nerve injury patients without initial light perception. Indian J Ophthalmol 1999;47:233-6. Agrawal A, Kakani A, Baisakhiya N, Galwankar S, Dwivedi S, Pal R. Developing traumatic brain injury data bank: Prospective study to understand the pattern of documentation and presentation. Indian J Neurotrauma 2012;9:87-92. Agrawal D, Sahoo S, Satyarthee GD, Gupta D, Sinha S, Misra MC. Initial experience with mobile computed tomogram in neurosurgery intensive care unit in a level 1 trauma center in India. Neurol India 2011;59:739-42. Agrawal M, Joshi M. Impact of rehabilitation on functional outcome during the first year of moderate and severe traumatic brain injury. Brain Inj 2014;28:292-7. Ahmad FU, Mahapatra AK, Mehta VS. Outcome of “unknown” head injury patients at a tertiary care neurosurgical centre. Neurol India 2006;54:73-4. Amin AP, Kulkarni HR. Improvement in the information content of the Glasgow Coma Scale for the prediction of full cognitive recovery after head injury using fuzzy logic. Surgery 2000;127:245-53. Bhattacharjee S, Layek A, Maitra S, Sen S, Pal S, Gozi NK. Perioperative glycemic status of adult traumatic brain injury patients undergoing craniotomy: A prospective observational study. J Neurosurg Anesthesiol 2014;26:313-9. Bhole AM, Potode R, Agrawal A, Joharapurkar SR. Demographic profile, clinical presentation, management options in cranio-cerebral trauma: An experience of a rural hospital in Central India. Pak J Med Sci 2007;23:724-7. Dalvie SS, Pai PR, Shenoy SG, Bapat RD. Analytical data of January 1993 communal riot victims–The KEM Hospital experience. J Postgrad Med 1993;39:5-9. Deepika A, Munivenkatappa A, Devi BI, Shukla D. Does isolated traumatic subarachnoid hemorrhage affect outcome in patients with mild traumatic brain injury? J Head Trauma Rehabil 2013;28:442-5. Dhandapani M, Dhandapani S, Agarwal M, Mahapatra AK. Pressure ulcer in patients with severe traumatic brain injury: Significant factors and association with neurological outcome. J Clin Nursing 2014;23:1114-9. Dhandapani S, Manju D, Sharma B, Mahapatra A. Prognostic significance of age in traumatic brain injury. J Neurosci Rural Pract 2012;3:131-5. Dhandapani S, Sarda AC, Kapoor A, Salunke P, Mathuriya SN, Mukherjee KK. Validation of a new clinico-radiological grading for compound head injury: Implications on the prognosis and the need for surgical intervention. World Neurosurg 2015;84:1244-50. Dhandapani S, Sharma A, Sharma K, Das L. Comparative evaluation of MRS and SPECT in prognostication of patients with mild to moderate head injury. J Clin Neurosci 2014;21:745-50. Dharap SB, Khandkar AA, Pandey A, Sharma AK. Repeat CT scan in closed head injury. Injury 2005;36:412-6. Francis R, Gregson BA, Mendelow AD, Rowan E; STITCH (Trauma) investigators (Appendix). Characteristics of traumatic intracerebral haemorrhage: An assessment of screening logs from the STITCH (Trauma) Trial. Br J Neurosurg 2015;29:655-60. Goel RS, Goyal NK, Dharap SB, Kumar M, Gore MA. Utility of optic nerve ultrasonography in head injury. Injury 2008;39:519-24. Gowda NK, Agrawal D, Bal C, Chandrashekar N, Tripati M, Bandopadhyaya GP, et al. Technetium Tc-99m ethyl cysteinate dimer brain single-photon emission CT in mild traumatic brain injury: A prospective study. AJNR Am J Neuroradiol 2006;27:447-51. Harish G, Mahadevan A, Pruthi N, Sreenivasamurthy SK, Puttamallesh VN, Keshava Prasad TS, et al. Characterization of traumatic brain injury in human brains reveals distinct cellular and molecular changes in contusion and pericontusion. J Neurochem 2015;134:156-72. Jain S, Dharap SB, Gore MA. Early prediction of outcome in very severe closed head injury. Injury 2008;39:598-603. Kannan S, Marudachalam KS, Puri GD, Chari P. Severe head injury patients in a multidisciplinary ICU: Are they a burden? Intensive Care Med 1999;25:855-8. Kaushal S, Midha V, Sood A, Chopra SC, Gupta C. A comparative study of the effects of famotidine and sucralfate in prevention of upper gastrointestinal bleeding in patients of head injury. Indian J Pharmacol 2000;32:246-9. Khan A, Prince M, Brayne C, Prina AM. Lifetime prevalence and factors associated with head injury among older people in low and middle income countries: A 10/66 study. PloS One 2015;10:e0132229. Kumar R, Gupta RK, Husain M, Chaudhry C, Srivastava A, Saksena S, et al. Comparative evaluation of corpus callosum DTI metrics in acute mild and moderate traumatic brain injury: Its correlation with neuropsychometric tests. Brain Inj 2009;23:675-85. Kumar R, Gupta RK, Rao SB, Chawla S, Husain M, Rathore RK. Magnetization transfer and T2 quantitation in normal appearing cortical gray matter and white matter adjacent to focal abnormality in patients with traumatic brain injury. Magn Reson Imaging 2003;21:893-9. Ahmed M, Sriganesh K, Vinay B, Umamaheswara Rao GS. Acute kidney injury in survivors of surgery for severe traumatic brain injury: Incidence, risk factors, and outcome from a tertiary neuroscience center in India. Br J Neurosurg 2015;29:544-8. Misra UK, Kalita J, Pandey S, Mandal SK. Predictors of gastrointestinal bleeding in acute intracerebral haemorrhage. J Neurol Sci 2003;208:25-9. Mohanty S, Mohanty MK, Panigrahi MK, Das SK. Fatal head injury in homicidal victims. Med Sci Law 2005;45:244-8. Mukherjee KK, Sharma BS, Ramanathan SM, Khandelwal N, Kak VK. A mathematical outcome prediction model in severe head injury: A pilot study. Neurol India 2000;48:43-8. Munjal SK, Panda NK, Pathak A. Audiological deficits after closed head injury. J Trauma 2010;68:13-8. Nayak C, Nayak D, Bhat S, Raja A, Rao A. Relationship between neurological outcome and early oxidative changes in erythrocytes in head injury patients. Clin Chem Lab Med 2007;45:629-33. Nayak C, Nayak D, Raja A, Rao A. Relationship between markers of lipid peroxidation, thiol oxidation and Glasgow coma scale scores of moderate head injury patients in the 7 day post-traumatic period. Neurol Res 2008;30:461-4. Nayak CD, Nayak DM, Raja A, Rao A. Erythrocyte indicators of oxidative changes in patients with graded traumatic head injury. Neurol India 2008;56:31-5. Perel P, Al-Shahi Salman R, Kawahara T, Morris Z, Prieto-Merino D, Roberts I, et al. CRASH-2 (Clinical Randomisation of an Antifibrinolytic in Significant Haemorrhage) intracranial bleeding study: The effect of tranexamic acid in traumatic brain injury-A nested randomised, placebo-controlled trial. Health Technol Assess 2012;16:iii-xii, 1-54. Pillai S, Praharaj SS, Mohanty A, Kolluri VR. Prognostic factors in children with severe diffuse brain injuries: A study of 74 patients. Pediatr Neurosurg 2001;34:98-103. Pillai SV, Kolluri VR, Mohanty A, Chandramouli BA. Evaluation of nimodipine in the treatment of severe diffuse head injury: A double-blind placebo-controlled trial. Neurol India 2003;51:361-3. Pillai SV, Kolluri VR, Praharaj SS. Outcome prediction model for severe diffuse brain injuries: Development and evaluation. Neurol India 2003;51:345-9. Prasad GL, Gupta DK, Mahapatra AK, Sharma BS. Surgical results of decompressive craniectomy in very young children: A level one trauma centre experience from India. Brain Inj 2015;29:1717-24. Pruthi N, Ashok M, Kumar VS, Jhavar K, Sampath S, Devi BI. Magnitude of pedestrian head injuries and fatalities in Bangalore, south India: A retrospective study from an apex neurotrauma center. Indian J Med Res 2012;136:1039-43. Pruthi N, Chandramouli BA, Kuttappa TB, Rao SL, Subbakrishna DK, Abraham MP, et al. Apolipoprotein E polymorphism and outcome after mild to moderate traumatic brain injury: A study of patient population in India. Neurol India 2010;58:264-9. Ramesh VG, Thirumaran KP, Raja MC. A new scale for prognostication in head injury. J Clin Neurosci 2008;15:1110-3. Ratan SK, Pandey RM, Ratan J. Association among duration of unconsciousness, Glasgow coma scale, and cranial computed tomography abnormalities in head-injured children. Clin Pediatr 2001;40:375-8. Ratan SK, Kulshreshtha R, Pandey RM. Predictors of posttraumatic convulsions in head-injured children. Pediatr Neurosurg 1999;30:127-31. Reddy RP, Rajeswaran J, Bhagavatula ID, Kandavel T. Silent epidemic: The effects of neurofeedback on quality-of-life. Indian J Psychol Med 2014;36:40-4. Saika A, Bansal S, Philip M, Devi BI, Shukla DP. Prognostic value of FOUR and GCS scores in determining mortality in patients with traumatic brain injury. Acta Neurochir 2015;157:1323-8. Salunke P, Garg R, Kapoor A, Chhabra R, Mukherjee KK. Symptomatic contralateral subdural hygromas after decompressive craniectomy: Plausible causes and management protocols. J Neurosurg 2015;122:602-9. Santhanam R, Pillai SV, Kolluri SV, Rao UM. Intensive care management of head injury patients without routine intracranial pressure monitoring. Neurol India 2007;55:349-54. Shanmukhi S, Panigrahi M. Serial pattern learning after mild head injury. Neurol India 2003;51:518-21. Sharma B, Gupta R, Anand R, Ingle R. Ocular manifestations of head injury and incidence of post-traumatic ocular motor nerve involvement in cases of head injury: A clinical review. Int Ophthalmol 2014;34:893-900. Singh AK, Suryanarayanan B, Choudhary A, Prasad A, Singh S, Gupta LN. A prospective randomized study of use of drain versus no drain after burr-hole evacuation of chronic subdural hematoma. Neurol India 2014;62:169-74. Singh M, Vaishya S, Gupta S, Mehta VS. Economics of head injuries. Neurol India 2006;54:78-80. Singh P. Missile injuries of the brain: Results of less aggressive surgery. Neurol India 2003;51:215-9. Singh SB, Chakraborty S, Jha KM, Haider S, Chandra S. Repeated measure analysis in raga therapy: A case study on head injury patients. Res J Pharm Biol Chem Sci 2013;4:420-8. Sinha S, Gunawat P, Nehra A, Sharma BS. Cognitive, functional, and psychosocial outcome after severe traumatic brain injury: A cross-sectional study at a tertiary care trauma center. Neurol India 2013;61:501-6. Sinha S, Raheja A, Garg M, Moorthy S, Agrawal D, Gupta DK, et al. Decompressive craniectomy in traumatic brain injury: A single-center, multivariate analysis of 1,236 patients at a tertiary care hospital in India. Neurol India 2015;63:175-83. Srinivasan US. A mathematical model for predicting the outcome in moderate head injury. Neurol India 2006;54:28-32. Suresh HS, Praharaj SS, Indira Devi B, Shukla D, Sastry Kolluri VR. Prognosis in children with head injury: An analysis of 340 patients. Neurol India 2003;51:16-8. Tabish A, Lone NA, Afzal WM, Salam A. The incidence and severity of injury in children hospitalised for traumatic brain injury in Kashmir. Injury 2006;37:410-5. Tandon A, Suri A, Kasliwal MK, Mahapatra AK, Mehta VS, Garg A, et al. Assessment of endocrine abnormalities in severe traumatic brain injury: A prospective study. Acta Neurochir 2009;151:1411-7. Tandon DA, Thakar A, Mahapatra AK, Ghosh P. Trans-ethmoidal optic nerve decompression. Clin Otolaryngol Allied Sci 1994;19:98-104. Thiruppathy SP, Muthukumar N. Mild head injury: Revisited. Acta Neurochir 2004;146:1075-82. Tripathi M, Tewari MK, Mukherjee KK, Mathuriya SN. Profile of patients with head injury among vehicular accidents: An experience from a tertiary care centre of India. Neurol India 2014;62:610-7. Wani AA, Ramzan AU, Malik NK, Qayoom A, Nizami FA, Kirmani AR, et al. Missile injury to the pediatric brain in conflict zones. J Neurosurg Pediatr 2011;7:276-81. Yousuf A, Khursheed N, Rasool I, Kundal V, Jeelani H, Afroze D. Genetic variation of ApoE gene in ethnic Kashmiri population and its association with outcome after traumatic brain injury. J Mol Neurosci 2015;56:597-601.
de Almeida CE, de Sousa Filho JL, Dourado JC, Gontijo PA, Dellaretti MA, Costa BS. Traumatic brain injury epidemiology in Brazil. World Neurosurg 2016;87:540-7. Yuan Q, Liu H, Wu X, Sun Y, Yao H, Zhou L, Hu J. Characteristics of acute treatment costs of traumatic brain injury in Eastern China-A multi-centre prospective observational study. Injury 2012;43:2094-9. Faul M, Xu L, Wald MM, Coronado VG. Traumatic brain injury in the United States: Emergency department visits, hospitalizations, and deaths 2002–2006. Centers for Disease Control and Prevention, National Center for Injury Prevention and Control: Atlanta, GA; 2010. Horton R. GBD 2010: Understanding disease, injury, and risk. Lancet 2010;380:2053-4. Peeters W, van den Brande R, Polinder S, Brazinova A, Steyerberg EW, Lingsma HF, et al. Epidemiology of traumatic brain injury in Europe. Acta Neurochir 2015;157:1683-96. Hyder, AA, Wunderlich CA, Puvanachandra P, Gururaj G, Kobusingye OC. The impact of traumatic brain injuries: A global perspective. Neurorehabilitation 2007;22:341-53. Mwita CC, Muthoka J, Maina S, Mulingwa P, Gwer S. Early management of traumatic brain injury in a tertiary hospital in central Kenya: A clinical audit. J Neurosci Rural Pract 2016;7:97-101. Tran TM, Fuller AT, Kiryabwire J, Mukasa J, Muhumuza M, Ssenyojo H, et al. Distribution and characteristics of severe traumatic brain injury at Mulago National Referral Hospital in Uganda. World Neurosurg 2015;83:269-77. Ozcakir A, Sadikoglu G, Armagan E, Tokyay R. Patterns and characteristics of trauma in a developing country. Traumacare 2004;14:135-9. Brooke BS, Nathan H, Pawlik TM. 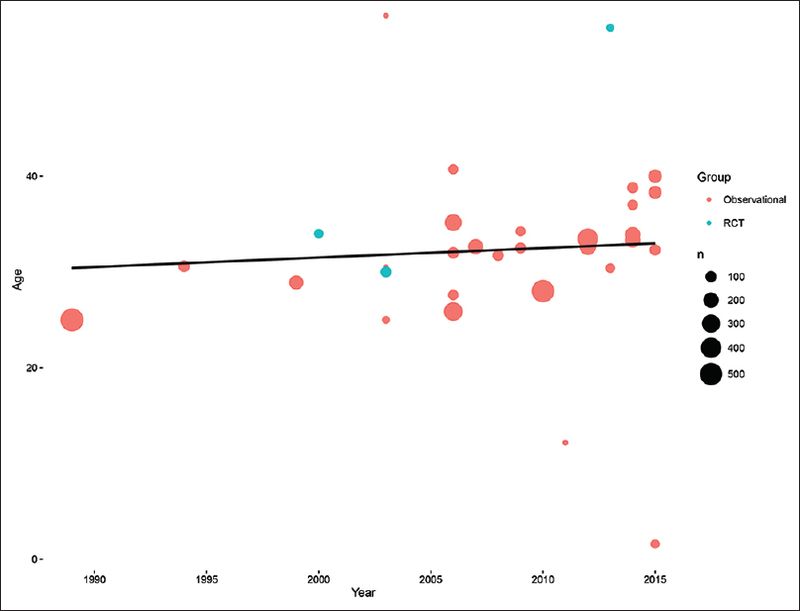 Trends in the quality of highly cited surgical research over the past 20 years. Ann Surg 2009;249:162-7. Hopewell S, Ravaud P, Baron G, Boutron I. Effect of editors' implementation of CONSORT guidelines on the reporting of abstracts in high impact medical journals: Interrupted time series analysis. BMJ 2012;344:e4178. Gardner JW. Abraham Flexner, pioneer in educational reform. Science 1960;131:594-5. Hunskaar S, Breivik J, Siebke M, Tømmerås K, Figenschau K, Hansen JB. Evaluation of the medical student research programme in Norwegian medical schools. A survey of students and supervisors. BMC Med Educ 2009;9:43. Rural population (% of total population). World Bank. Available from: <http://data.worldbank.org/indicator/SP.RUR.TOTL.ZS>. [Last accessed on 2016 Jan 4]. Gerber LM, Chiu YL, Carney N, Härtl R, Ghajar J. Marked reduction in mortality in patients with severe traumatic brain injury. J Neurosurg 2013;119:1583-90.